There are many reasons to love this beautiful country. At Pacific Resources International we have developed our mission around these four important components. New Zealand is one of the very few countries that have strict regulations for GMO. The Hazardous Substances and New Organisms Act 1996 (HSNO Act) regulates research into all living organisms that do not already exist in New Zealand, including those that are genetically modified. The HSNO Act applies to anything that can potentially grow, reproduce and be reproduced, whether or not it is also food or medicine. This is why New Zealand’s small population and remote position in the South Pacific allows it to retain one of the cleanest environments on the planet. Seawater contains over 2.5 percent sodium chloride, as well as significant amounts of another salt. Lake Grassmere harvests some 60,000 to 70,000 tons of salt each year. Seawater is pumped into the 688-hectare main lake continuously throughout summer. As nature does its work, evaporation increases the sea water’s strength. Further evaporation takes place as it is pumped into a series of concentrating ponds. During the summer months, the brine reaches a saturation point. It is then transferred into crystallization ponds. A testing process occurs in the ocean water while the salt is drying. Then retested when it is packed. This process enables the salt certification by BioGro for organic input. It contains no contaminants. The pollution of ocean water in most of the world makes it very hard to remove impurities. Manuka honey has been globally recognized as one of nature’s superfoods. The unique New Zealand import has incredible antibacterial properties. Although most honey has antibacterial qualities, only Manuka Honey contains methylglyoxal (MG), one of the key qualities in Manuka Honey. The higher the concentration of MG, the more powerful the antibiotic effect. 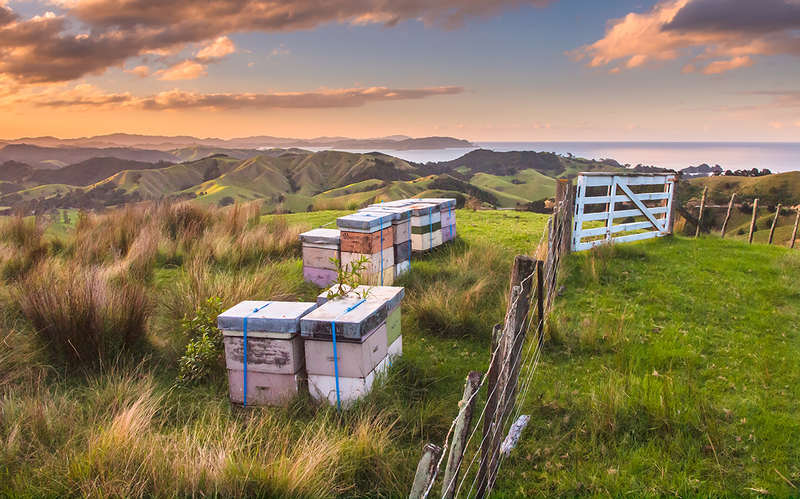 This is the reason honey producers have developed a scale for rating the potency of Manuka Honey. The Manuka tree is native to New Zealand. It’s more commonly found in the drier climates of the Central North Island as well as the East Coast of the country. We should not underestimate the importance of the honey bee to the survival of life on earth. It’s thought that honey bees are responsible for pollinating approximately 70% of the food we eat. One of the easiest ways we can help bees is by planting bee-friendly gardens in both urban and rural spaces. Bees need food so they can help pollinate our food. Bees forage on wildflowers and other plants for nectar and pollen which provide carbohydrates and protein for growth and energy. Well-nourished bees are more capable of fending off disease and parasites. Another way you can help the bees is by not spraying your garden with harmful pesticides. Before you do, consider whether spraying is necessary. If you choose to proceed, do not spray when plants are in flower or bees are present. Previous Pacific Sea Salt Facts That Will Surprise You!